As with her other new Schumann disc [ARTS 47755-8], this one gives us a first-rate view of these simple, but not simplistic pieces [for children]. I cannot think of a recording I would recommend before this one. Alessandra Ammara has already demonstrated her talents as an excellent exponent of Schumann (Schumann: Carnaval, Davidsbündlertänze) and without a doubt her performance of the 'Album for the Young' is to be numbered with the best available. She floats Schumann's simpler melodies with sweet innocence and no trace of archness or sentimentality, phrasing poetically and meticulously following Schumann's many tempo and dynamic instructions. She also follows all repeats and uses the composer's indications for pedalling, which he often used for particular effects. As well as limpid poetry, she also shows great strength and rhythmic control in the more energetic and strenuous pieces. Put simply, I would have cheerfully bought this disk for the exquisitely dreamy sweetness of 'Mignon' and the sinister darkness of the two 'Winter' pieces, amongst many other felicities in this set. The Arts engineers have captured excellent and immediate sound from their Steinway D, ...Completely absorbing, and highly recommended. This is a highly desirable release from a woman who is definitely making some noise in the classical world. 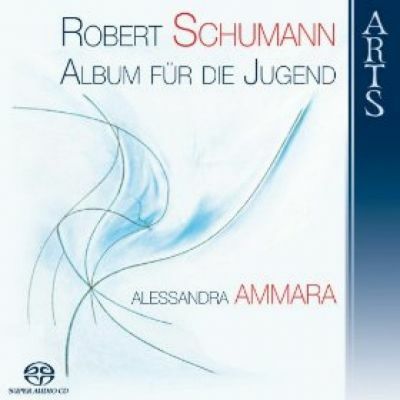 Alessandra Ammara gives us the best recording of Schumann's Album für die Jugend since Michael Endres' reference version. She plays these teaching pieces like real music, and matches Endres' ability to project both the music's simple sentiments and inner sophistication. (...) Arts Music's surround-sound engineering is marvelously full and realistic, and scarcely less so via conventional two-channel stereo playback. Strongly recommended."